The ways in which surgical patients with solid tumor cancers are treated change and evolve every day. Critical progress is being made, exciting innovations unveiled and new discoveries continually emerge. The SSO Annual Cancer Symposium is where you go to learn about the array of research developments, clinical trials, new technology, and future trends in cancer care. And much of what you’ll learn at SSO 2019 can immediately be integrated into your treatment plans. A Schedule Designed with the Attendee in Mind! Launched last year with great success, the schedule this year is again designed by disease-site track, allowing you to focus on the content relevant to your practice. 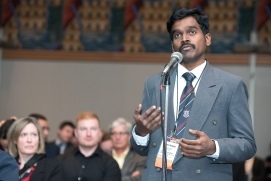 Two Invited Lectures and the SSO Presidential Address spread out over the course of the program. Two Great Debates sessions, with leading surgeons covering four controversial topics. 16 Symposia sessions covering current controversies, new developments, and pivotal scientific updates. 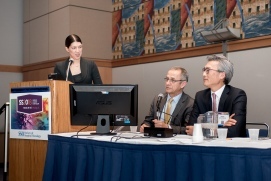 8 Meet the Professor (MTP) Breakfasts featuring presenters of international prominence leading small-group discussions exploring challenging issues or interesting topics in surgical oncology. Thought-provoking Abstracts covering cutting-edge science and clinical trials. The Scientific Program Committee has added additional parallel sessions to schedules of the past—SSO 2019 will include two plenary sessions, 14 disease-site parallel sessions, video sessions and over 375 poster presentations. 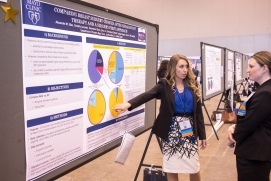 Abstracts cover breast, colorectal, endocrine, hepato-pancreato-biliary, melanoma, quality improvement/clinical outcomes, sarcoma, thoracic, upper gastrointestinal, and more. Fellows & Residents Lounge offering open access to SSO members, networking opportunities with SSO leadership and program directors, and discussions tailored specifically toward fellows and residents. Three Pre-Meeting Courses, designed to provide an emphasis on practical information for the practicing surgeon. Industry Forums and Industry Satellite Symposia. In addition to an outstanding line-up of educational offerings, this year attendees will have additional time to network, collaborate, and connect with friends and colleagues. Describe recent updates and current controversies in the multidisciplinary management of patients with breast cancer, melanoma, sarcoma, pancreas and hepatobiliary malignancies, esophageal cancer, thyroid and adrenal cancer, gastric cancer, colorectal cancer, neuroendocrine tumors, and peritoneal surface malignancies. Discuss advances in basic and translational sciences, including demonstration of an understanding of prognostic and predictive assays as applicable to cancer care, through presentations of original research performed by members of the Society. Discuss the rationale for neoadjuvant therapy and/or genetic testing in the context of personalized cancer care. Discuss the goals of cost, value, and quality as applied to cancer care. Describe novel techniques in cancer surgery.